The PROF 5 is also available with the option of a hydraulic feed roller. This significantly increases the output of the machine. You only have to feed the wood in, and then the machine conveys it inside by itself. The force with which this feed roller does its work leaves even the most twiggy branches no chance at all. Large volumes of leafy trimmings are also mercilessly fed to the blades. One can manually adjust the rotation of the feed roller (reverse – feed – stop). This operating governor is next to the feed-in opening and is thus always within reach as an emergency stop. 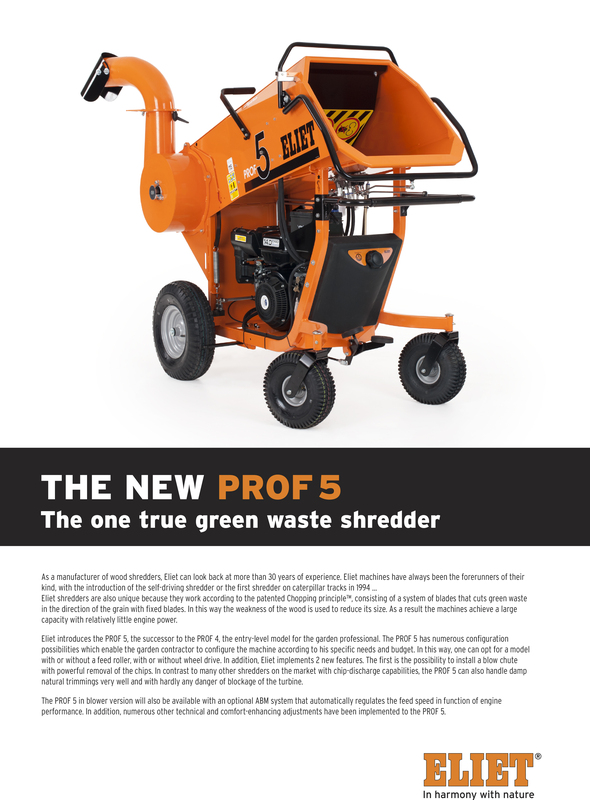 The PROF 5 is a full-blooded green waste processor. Garden contractors mainly have to deal with voluminous natural trimmings primarily from hedges, shrubs, bushes, plants … thus the PROF 5 becomes their indispensible partner. By means of the wide feed-in opening (560 mm x 520 mm) with auxiliary feed, there is no problem feeding in large amounts of green waste. The feed-in funnel does not reduce further in size in the direction of the blade axis. The PROF 5 is constructed from a strongly welded frame and rests on a couple of large tires. With a wheel base 780 mm wide, this shredder is extremely stable even if one temporarily deviates from the beaten tracks. The large swivel castor wheels enable the PROF 5 to easily navigate through narrow garden passageways. 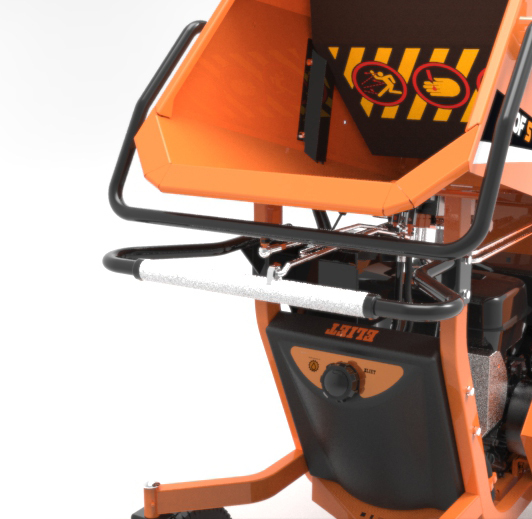 The machine is equipped with a parking brake for maximum safety while working and during transport. The blades that are fitted to the Prof 5 are not ordinary steel blades. The Prof 5 is designed to operate at least 8 hours a day. The blades have been specially designed so that their blade life matches the workload and duty cycles. For the PROF 5 B, ELIET opted for a 14 HP Subaru Robin engine because of its favourable torque curve. This modern engine has OHC (Overhead Cams) technology which enables higher compression in the cylinder which translates into better performance. The camshaft is driven by a chain for very precise valve timing and again more stable functioning. The engine comes standard with an electric starter. Your comfort was the priority that was top of our engineer's minds when they designed the wheel drive. You cannot simply move a shredder weighing 350 kg wherever you want. So the Prof 5 is also available self-propelled. Each of the two drive wheels is equipped with a powerful hydraulic motor. If you purchase the self-propelled version, then you will be able to navigate any rugged terrain or slope with the greatest of ease. The swivel caster wheels provide the necessary manoeuvrability for weaving between obstacles in gardens, parks and woods. A handlebar mounted lever allows you to change forward or reverse speeds with a simple flick of the wrist. The further you move the lever forwards or back, the faster the machine moves in the chosen direction.